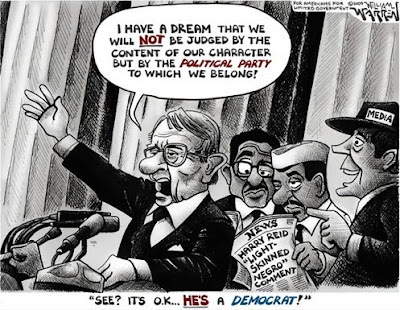 Harry Reid: "I have a dream that we will NOT be judged by the content of our character but by the POLITICAL PARTY to which we belong!" Media Bias: "See it's OK . . . He's a Democrat!" Tags: Harry Reid, political satire, William Warren To share or post to your site, click on "Post Link". Please mention / link to the ARRA News Service. Thanks!